When it comes to movie franchises, particularly those of the "three and done" variety, the odds are ever in the second film's favor. These films are typically darker, larger in scale, and the filmmakers behind them jump at the bit to craft a perfect setup for the trilogy's conclusion. 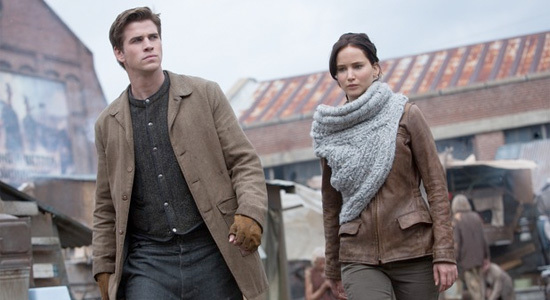 These are all aspects The Hunger Games: Catching Fire wears, one badge of honor on its collective chest after another. Based on the novels by Suzanne Collins, the film serves as a smooth, beautiful, and epic transition from the clunky adaptation of the first novel to a hopefully explosive finale in Mockingjay. If nothing else, there will be fire. Jennifer Lawrence and Josh Hutcherson return in their respective roles as Katniss Everdeen and Peeta Mellark, citizens of the 12th District of the future North America, Panem. Katniss and Peeta, co-winners of the 74th Annual Hunger Games the previous year, now find themselves worldwide celebrities, touring through the impoverished and oppressed Districts. But the Capitol and President Snow (Donald Sutherland), ruling as a heartless dictator, wish to use Katniss and Peeta to crush the revolution that is beginning to brew among the 12 Districts. Much of this second film in the Hunger Games trilogy is spent on this tour, the pageantry that Panem holds in such high regard on seemingly constant display. Screenwriters Simon Beaufoy and Michael Arndt - writing here under the name Michael deBruyn - take their time getting to the meat of the film, the 75th Annual Hunger Games, where President Snow has a few menacing tricks up his sleeve to commemorate the milestone anniversary. The Games do eventually commence, but only after the colorful characters and engaging world Collins created on paper has been appropriately brought to magnificent light. There are a lot of unanswered questions going on inside Catching Fire, most of them pertaining to the rules of this future society, but Beaufoy and Arndt do a masterful job of giving us just the information we need without appearing to hand-hold us through this world. Panem feels more like something real in Catching Fire, at the same time more expansive and more grounded than what director Gary Ross delivered in The Hunger Games. The directing duties were handed over to Francis Lawrence this time around, and the director certainly captures the look Ross built up in the first film. Gritty and gray when it comes to the Districts and gaudy and glamorous for the Capitol, Lawrence takes the ball and charges headfirst into this vast future world. As with Beaufoy and Arndt and their adaptation of Collins' work, Lawrence appears to be fascinated by the details. The sheen on Stanley Tucci's character Caesar Flickerman's teeth has never been this bright. Major kudos must also be thrown at Collins' feet for her character naming abilities. But the oppressive government and potential revolution are only the catalysts for the film's main attraction, The Hunger Games, two volunteers from each District competing in brutal combat inside an arena until only one - or two given Katniss' penchant for rule-bending - person survives. As with the first film, this is where Catching Fire begins to slip from captivating and awe-inspiring sci-fi bliss to charged but still clunky action. Katniss and Peeta, both competing in the Games once again, now find themselves in a tropical region, allying and battling with a whole new cast of eccentric characters. The Games in Catching Fire never really find a strong foothold, and though their purpose to the story of the trilogy is solid and important, they come off as something of an afterthought. Those new allies and the depth they bring help, but the characters our protagonists go up against are little more than names and faces. Once again, the story is rushed, that old problem with adapting a 400-page novel to a 150-page screenplay rearing its typically ugly head, and the film comes to an abrupt end, all the more abrupt if you haven't read Collins' novels. Fortunately, the film works the revolution and government angle in the background the whole way through, setting up for a potentially awesome two-part cinematic finale. 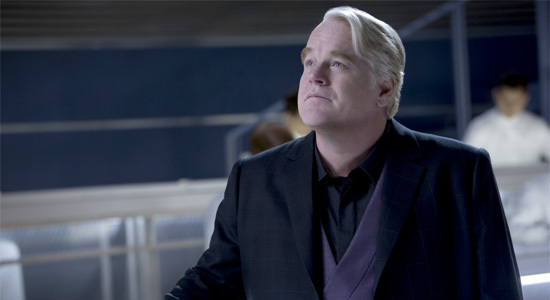 Sutherland and newcomer Philip Seymour Hoffman, replacing Wes Bentley as the gamemaker, are, no pun intended, on fire in every scene they share here. Hoffman's character brings an added level of threat to the 75th Games, his traps and tricks far more entertaining than watching people swing axes and fire arrows at their competition. The actors filling the variety of roles are equally intriguing, Elizabeth Banks and Woody Harrelson the most dynamic return of these as the eccentric and quite literally colorful Effie Trinket and Haymitch Abernathy, respectively. Jeffrey Wright, Amanda Plummer, and Jena Malone are all superb as competitors in these new Games, and Liam Hemsworth comes back to build on the love triangle between he, Katniss, and Peeta. All of these trilogies must now come complete with a love triangle, and the one at work The Hunger Games series is incredibly enticing simply for the way it moves in and out of the story. Hutcherson is solid as Peeta, but there's no denying Lawrence is the true star of this series. Her portrayal of Katniss Everdeen brings every ounce of strength the character needs to come off as believably sympathetic. She doesn't want to lead a revolution, but matters force her hand, and Lawrence nails both the reluctance and the energy the character moves from as her government bears down on its people even harder. The idea of revolution is nothing new, and Catching Fire - The Hunger Games series as a whole, really - has little fresh to offer when it comes to playing in that arena. However, the world-building at work here and the constant stream of dynamite plot points keeps Catching Fire from ever becoming less than. Quite the contrary. The film brushes over quite a bit, but what the screenwriters and director Lawrence have given us is an energetic and solid second entry into what could potentially become a top-notch trilogy. 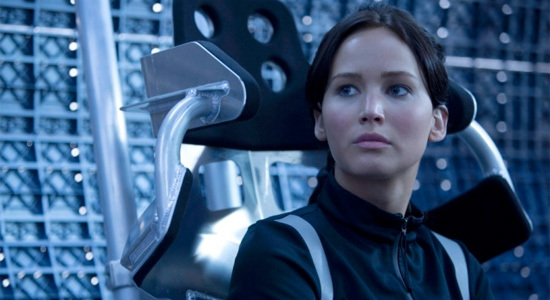 Catching Fire does just that for The Hunger Games franchise, and though that fire never rises to awesome heights, it absolutely whets its audience's appetite for what is to come. It is a good movie and I enjoyed it, but they made it more PG 13. I think first one captured the brutality of the games better. That is true, but the focus here was more political. Personal relationships were also important. The games were clearly not a focus but more a tool here. The details of the action of the games were not what was really important. How they were used for political control was what was important.